The Jersey Blue Chapter NSDAR was first organized on February 14, 1894, at the home of Miss Julia Leupp by 13 women with the desire to represent the historically-significant city of New Brunswick, New Jersey. Miss Kate Deshler was elected as the first Regent of the newly formed chapter. Our founding members chose the name "Jersey Blue" to honor New Jersey's first military regiment, the famed Jersey Blues, blue-uniformed troops from Piscataway who served in the Continental Army during the American Revolution. Since 1914, our chapter has been the stewards of Buccleuch Mansion, the historic home of General George Washington's aide-de-camp, Anthony Walton White. The mansion is open to the public as a museum with chapter members serving as docents. Carrying on a proud and long-standing tradition of supporting America's service men and women, our chapter manages a clothing room at the Menlo Park Veterans' Home and sponsors other recreational activities for veterans. Learn more about our activities and programs here, or find an upcoming event here. Explore the Jersey Blue Chapter's rich history - its beginnings, growth and milestones. Jersey Blues helped the Revolutionary Memorial Society, along with the General Frelinghuyses and Camp Middlebrook Chapters, to raise funds through loan exhibitions and teas to restore and preserve the Wallace House in Somerville, New Jersey. Jersey Blue awards its first scholarship of $5 in gold to a student at New Brunswick High School with the highest marks in United States History, beginning a long tradition of educational scholarship. Today, this program continues with an historical essay. Jersey Blue assists in the renovation of the Old Barracks in Trenton, New Jersey. Anthony Dey leaves the city of New Brunswick his beautiful estate on the edge of town to be kept in perpetuity as a park for the use of the citizens. In this park, stands the fine old house known as Buccleuch Mansion. 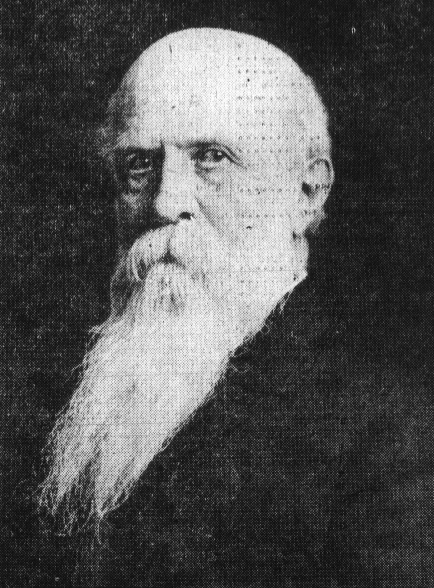 Anthony Dey, in the later years of his life, who gave Buccleuch Park to the city of New Brunswick. Jersey Blue opens Buccleuch Mansion to the public as a local historical site and museum with chapter members serving as docents. The Jersey Blue Chapter sponsors the Colonel John Nielson Society, Children of the American Revolution (C.A.R. ), in honor of the New Brunswick patriot. Over 100 children enrolled as charter members. Charter members and friends of the Colonel John Neilson Society, including parents, friends and Jersey Blue members. Photo via The Sunday Times, New Brunswick, New Jersey, Sunday, October 15, 1922. The Jersey Blue Chapter honors the 250th anniversary of the founding of New Brunswick by hosting a Colonial Tea at Buccleuch Mansion, complete with members dressed in colonial costumes and white silky wigs, for guests, officials and officers of the city. Chapter members gather on the front porch of Buccleuch Mansion for a Colonial Tea to honor the anniversary of the City of New Brunswick. Kenmore, the home of Betty Washington Lewis, youngest sister to George Washington, and the last home except Mount Vernon still standing associated with Washington throughout his life, undergoes massive renovations. Decayed beams from the house, originally put there under the supervision of Colonel Fielding Lewis and Washington himself, are removed and enough wood is left to make a few gavels, of which Jersey Blue is selected to receive one for its outstanding service to Kenmore over the years. Jersey Blue gathers dozens of silk stockings, several yards of shirting and unbleached muslin, balls and skeins of wool and cotton for knitting and crocheting for immigrants arriving at Ellis Island. Jersey Blue Daughters spend a total of 11,941 hours in war work, including meal preparation for soldiers stationed at Camp Kilmer and the Raritan Arsenal, as well as sewing surgical dressings, knitting sweaters and volunteering as nurses' aids in the Red Cross Home Service, Red Cross Canteen Unit and Civil Air Patrol. 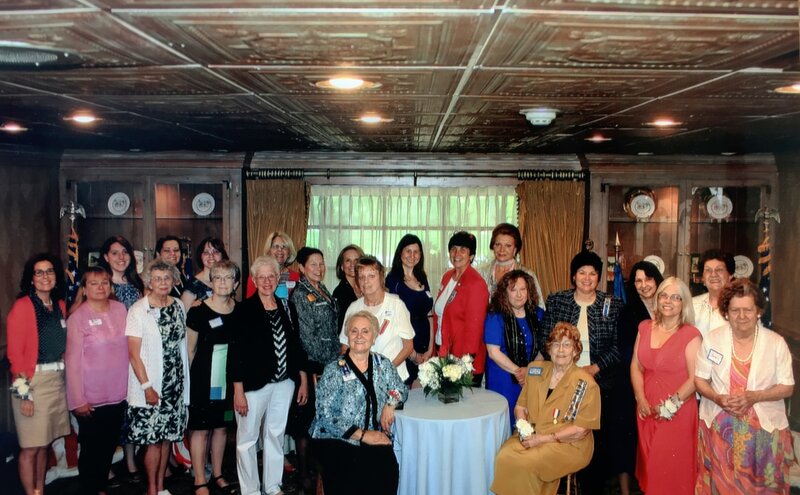 The Jersey Blue Chapter DAR celebrates its 125th Anniversary with a commemorative luncheon. The Jersey Blue Chapter NSDAR is organized at the home of Miss Julia Leupp with 13 members. Miss Kate Deshler is elected as the first Regent. Jersey Blue becomes the sixth chapter organized in the State of New Jersey. Miss Kate Deshler, founding Regent of Jersey Blue. 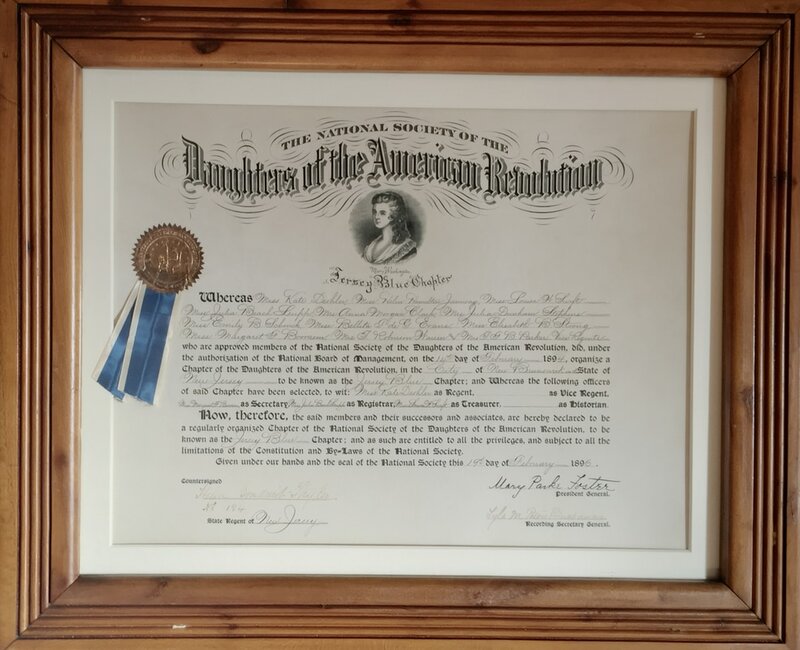 The National Society Daughters of the American Revolution issues the Jersey Blue Chapter with an official charter. The original charter issued on February 19, 1896, lists the names of the original 13 members. Today, it hangs in the archives of Buccleuch Mansion in New Brunswick, New Jersey. 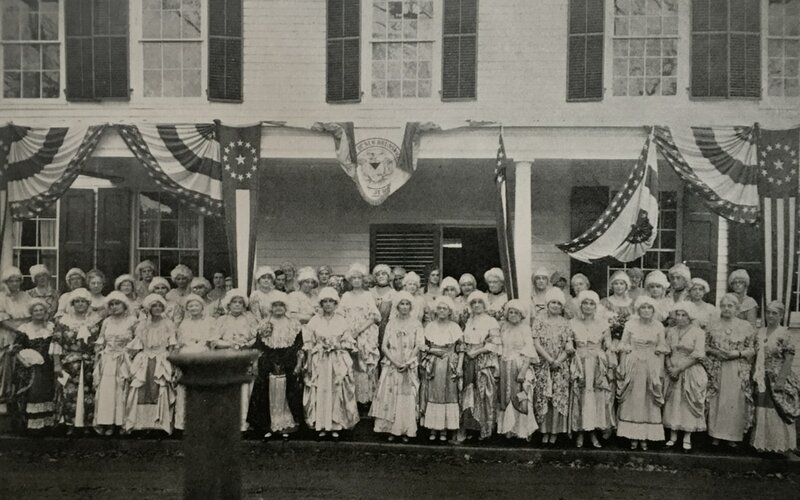 Jersey Blue Daughters raise much-needed funds for the DAR Hospital Corps during the Spanish-American War by hosting a series of events and ticketed entertainments. Jersey Blue organizes the Visiting Nurses' Association (VNA) of New Brunswick. Within three years, the VNA is large enough to be self-sufficient and run entirely on its own. Jersey Blue assumes stewardship of Buccleuch Mansion, the historic home built by Anthony Walton White, General Washington's aide-de-camp. Jersey Blue's only Real Daughter, Mrs. Mary S. Walton, becomes a member of the chapter. Mrs. Walton's father, Cornelius Suydam, was a soldier during the Revolutionary War, making her a Real Daughter of the American Revolution. Mrs. Mary Walton, ca. 1919. Jersey Blue helps save the 1760 Henry Guest House, one of the last surviving colonial residences in New Brunswick and the former home of our chapter's third Regent, Elizabeth Vail, from demolition. The historic structure is moved to the grounds of the New Brunswick Public Library on Livingston Avenue and preserved as a museum, art center and meeting space. Jersey Blue bestows the first commemorative medal commending the Rutgers University ROTC student judged as the most soldierly member of the senior class, an honor that continues today. Jersey Blue Daughters are invited as special guests to the Third Annual Woman's Conference on Current Problems at the Waldorf-Astoria Hotel in New York City. Guest speakers at the conference include Madame Currie, Mrs. Franklin D. Roosevelt and Frances Perkins, Secretary of Labor and first woman member of the cabinet. As the nation is plunged into war, members gather regularly to sew and knit for the Red Cross, while other members teach home nursing and first aid, or volunteer for hospital emergency preparation. The Jersey Blue Chapter NSDAR celebrates the 120th anniversary of its founding with a series of commemorative events and activities. Jersey Blue Chapter members at the 120th Anniversary Luncheon. Join more than 800 women who have been a part of our chapter since its founding and learn why Jersey Blue is a group in which we all ​love to belong.